Nidesoft DVD to MP4 Converter is great easy-to-use DVD to MP4 converter software which helps you convert DVD to MP4 (MPEG-4), H.264, DVD to DivX video for all MP4 players like Archos AV500, Archos AV700, Archos GMini402, iRiver PMP-100, Creative Zen Vision, iPod, PSP, etc. Wiht Nidesoft DVD to MP4 Converter fully support,you can rip DVD to MP4 with great stabilization,it provides super fast speed for ripping DVD to MP4 format. ...... any segment, trim and crop DVD, select target subtitle and audio track. You also can rip audio signal from DVD movie to MP3, WMA format. Do not hesitate. Download DVD to MP4 Converter at once, enjoy your favorite DVD movie on all MP4 players anytime and anywhere. 1.Automatically rip DVD from DVD drive to MP4, MPEG-4, and M4V video. 2.Easily convert DVD to MP4 for all portal player likes Archos AV500, Archos AV700, Archos GMini402, iRiver PMP-100, Creative Zen Vision, iPod, PSP, etc. 3.Support rip audio signal from DVD to MP3, M4A, AAC. 4.Powerful Video editing, allow you to adjust brightness, contrast, volumn, etc, .And check the audio track or caption of videos as you like to convert DVD to MP4. 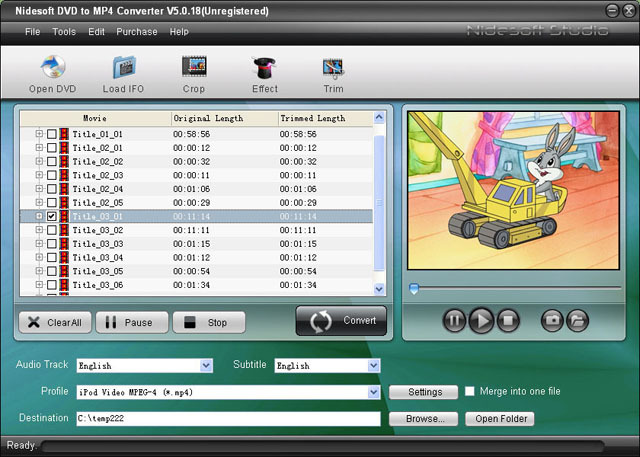 5.Support video Trimming and Cropping, set the start and end of the DVD movie to get your desired segment. Cut off the redundant part such as the black borders of DVD movie, view your DVD on all kinds of MP4 player with full screen. Qweas is providing links to Nidesoft DVD to MP4 Converter 5.4.76 as a courtesy, and makes no representations regarding Nidesoft DVD to MP4 Converter or any other applications or any information related thereto. Any questions, complaints or claims regarding this application Nidesoft DVD to MP4 Converter 5.4.76 must be directed to the appropriate software vendor. You may click the publisher link of Nidesoft DVD to MP4 Converter on the top of this page to get more details about the vendor.